Posted on August 13, 2010, in baking and tagged baking, Christmas, gingerbread, Kids Cookery. Bookmark the permalink. 20 Comments. Congrats on being so organised! Brilliant – these are fantastic! 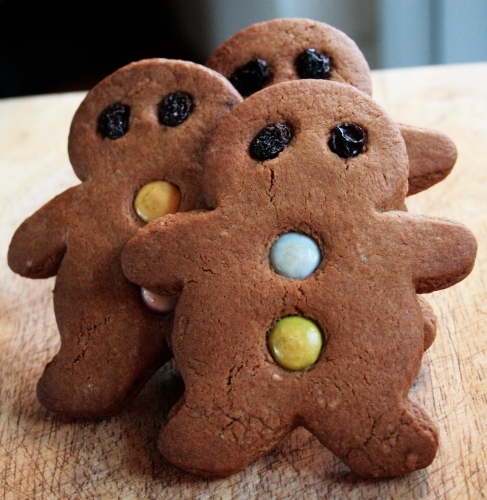 The thought of an afternoon’s baking and munching on gingerbread people dunked in tea sounds divine. I think the problem of rotund bellies post baking session is universal! I challenge anyone for a solution?! Looks great as always, I can’t wait to try the recipe out for myself and impress a lucky lady who love gingerbread! As she loves ginger I would certainly recommend putting the 2 tsp rather than 1tsp of ginger in. These little guys are seriously cute! Aww, they look so fabulous! Think the kids will have a great time making those. I’ve just stumbled across your blog for the first time coming through from Fennel and Fern and think it’s fabulous. I will definitely be back! I adore these and love their round shape! I must try the recipe as like you I have struggled to find a gingerbread recipe I like. Your CC sounds great and so much fun! 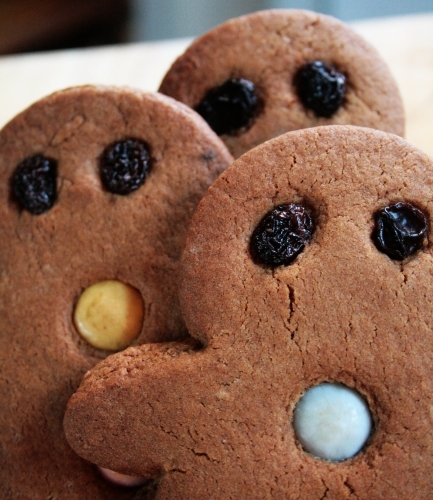 I love these gingerbread men and how you’ve decorated them, too cute. looks like a lovely recipe.do you think it is reasonable to cook & store them in tins this far before christmas & if sealed in cellophane,would they still make lovely edible presents-if not do you have a recipe for long lasting edible gingerbread men? I really don’t think these would last until Christmas if made now. They wouldn’t go off as such, they would go a bit soggy. I would recommend this Nigella recipe https://thebutcherthebaker.wordpress.com/2007/12/07/christmas-decoration-biscuits/ I traditionally make these at the beginning of December and decorate the tree with them. They are still edible by boxing day. I made these tonight, and they get a BIG thumbs up from me. I like my gingerbread on the soft side, so I rolled the pastry fairly thick and kept the baking time to a minimum. I’m also a big ginger fan (a ginger nut?!) so I went for an extra sprinkle or two. Oh, and I started the recipe, only to find that i had no golden syrup in the house. But no disaster – I subsituted with half honey and half maple syrup and it was perfect. Hi Rachel, so pleased to hear these have gone down well. My pupils have loved making them. Just discovered your excellent site. Must try this recipe. A good gingerbread man is hard to find. I look forward to more ginger-based recipes.